This model is valid CellML and runs in PCEnv, OpenCell and COR. The units have been checked and are consistent. The model itself runs to reproduce published results within a margin of error, which was judged to be acceptable, as the model authors explicitly state that the figures reproduced in the paper are only representative of the actual results. ABSTRACT: A general mathematical model describing the biochemical interactions of the hormones luteinizing hormone releasing hormone (LHRH), luteinizing hormone (LH) and testosterone (T) in the male is presented. The model structure consists of a negative feedback system of three ordinary differential equations, in which the qualitative behavior is either a stable constant equilibrium solution or oscillatory solutions. A specific realization of the model is used to describe the experimental observations of pulsatile hormone release, its experimental suppression, the onset of puberty, the effects of castration, and several other qualitative and quantitative results. This model is presented as a first step in understanding the physicochemical interactions of the hypothalamic-pituitary-gonadal axis. Schematic diagram of the mathematical model representing the male hypothalamic-pituitary-gonadal system. The model has three main components: the hypothalamus which secretes luteinizing hormone releasing hormone (LHRH), the pituitary which responds to LHRH by secreting luteinizing hormone (LH), and the gonads (or testes) which, in responds to LH, secrete testosterone. 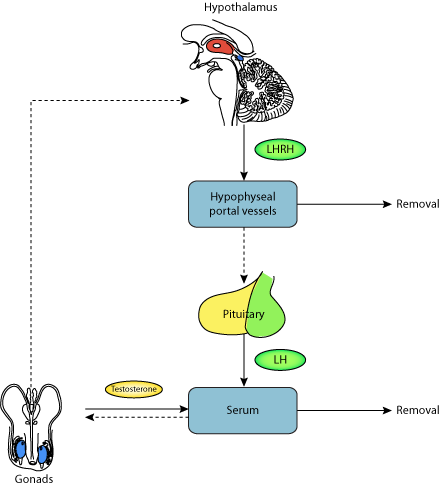 Finally, LH and testosterone feedback on the hypothalamus to regulate LHRH secretion. Derived from workspace Smith, 1980 at changeset 62da0a1f9920.